Following a showing in New York, Temperley London staged its “Second Global Digital Installation” in hip venue Sketch, not far from some major shopping thoroughfares downtown. In what is quickly becoming a recurring theme at London Fashion Week – referring to the odes of fantastic fairytale otherworldliness paid by Kinder Aggugini and Mulberry – designer Alice Temperley titled her ready-to-wear collection “Circus.” Unlike those two shows, she paid tribute to the colors and performers of ‘20s and ‘30s era circuses without exposing a hidden sinister sub-layer. For the most part, the collection was vintage Temperley without being over the top. Half-length dresses with vertical designs such as large studded diamond shapes and thick stripes were the order of the season for a number of looks. Standouts included a double-strapped blaze dress with exquisite tie detail down the front and in an attached belt, and a black mini tally dress with embroidery. 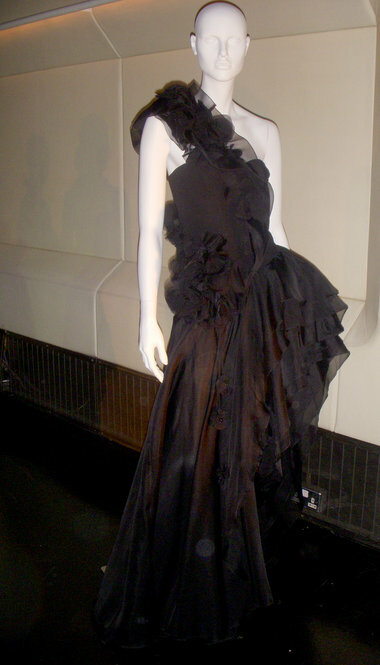 A black ruffled one-shoulder floor-length evening gown on the mannequin closest to the door was especially red carpet worthy. Neckpieces and belts, such as a black number with a series of trotting golden horses across the band, added much playful flair to the wardrobe.